Nitecore has been making battery chargers for many years. 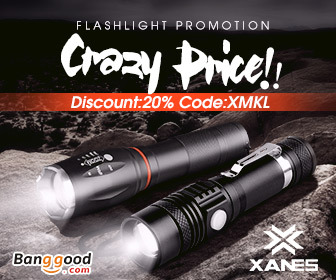 They have proven to be of high quality. 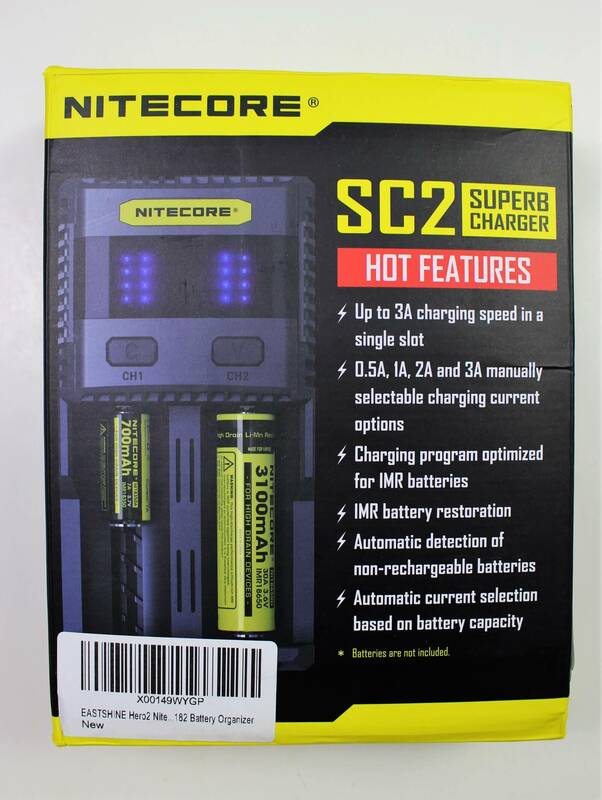 Now we have the Nitecore SC2 (Superb Charger) which takes battery charging to new heights in terms of power. To plug in the SC2 and see its somewhat “robotic” display of little neatly stacked “bullet points” doesn’t look terribly impressive. 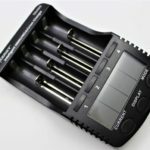 The chargers of late, including previous versions from Nitecore, have made us accustomed to actual “digits” in the display. But, with the SC2, that has all changed. 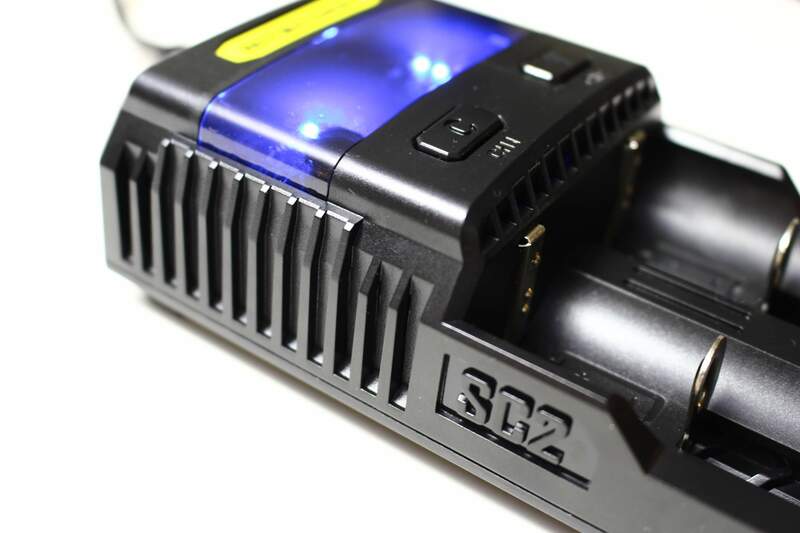 The selling point of the SC2 is its ability to charge at an extremely fast 3A current! 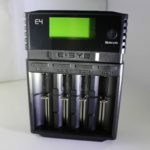 Their should be an asterisk next to that, because those high amps depend on what type of battery you’re charging, and which slot you’re using. More on that coming up. 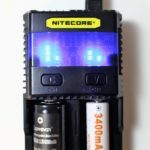 The Nitecore SC2, like most chargers today, can accept both Lithium-ion and NiMH batteries. 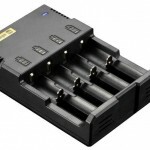 Where the SC2 might differ from some, is that it also accepts LifePO4 cells and is optimized for IMR batteries. The dimensions are 6.10″ x 3.16″. It weighs 9 ounces without batteries. 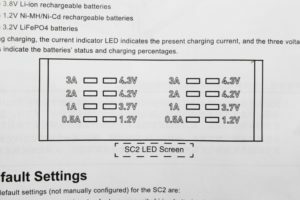 The SC2 can charge a long list of battery sizes. 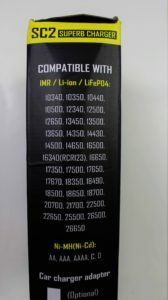 Here’s a photo of the side of the box where they’re all listed. 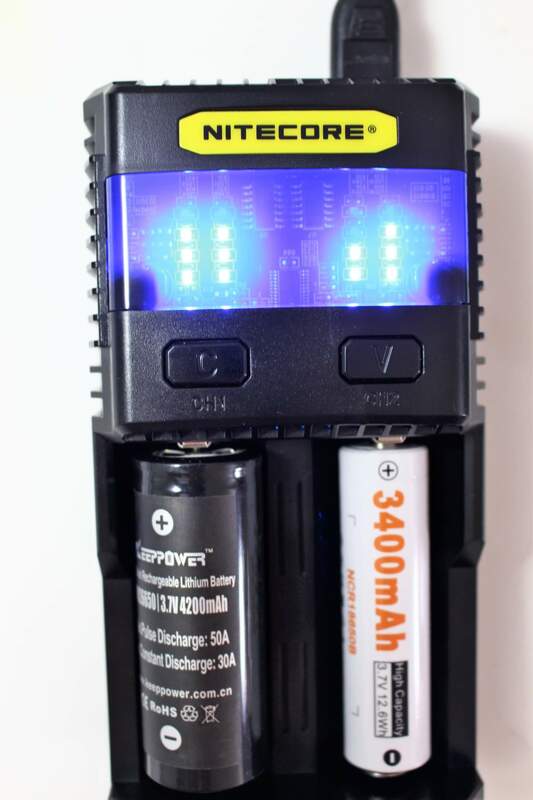 If it’s a lithium battery and the capacity is MORE than 1200mAh, the unit will select a current of 2A, and a 4.2 charging voltage. 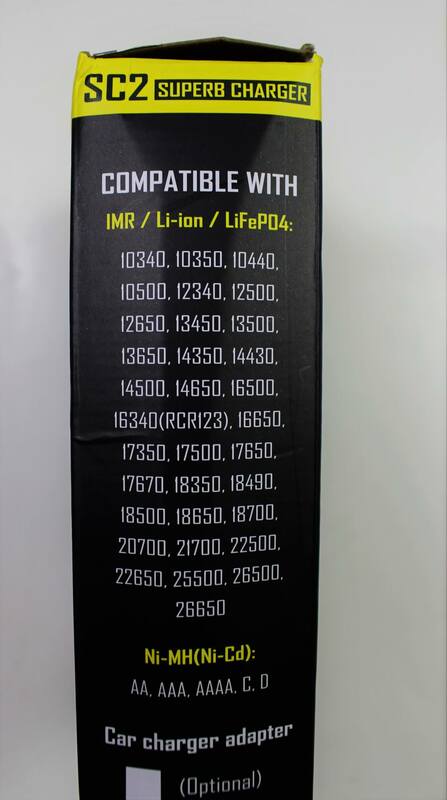 When the battery is LESS than 1200mAh, for instance a 16340, 18350 or a 14500… it will select 0.5A as the current. 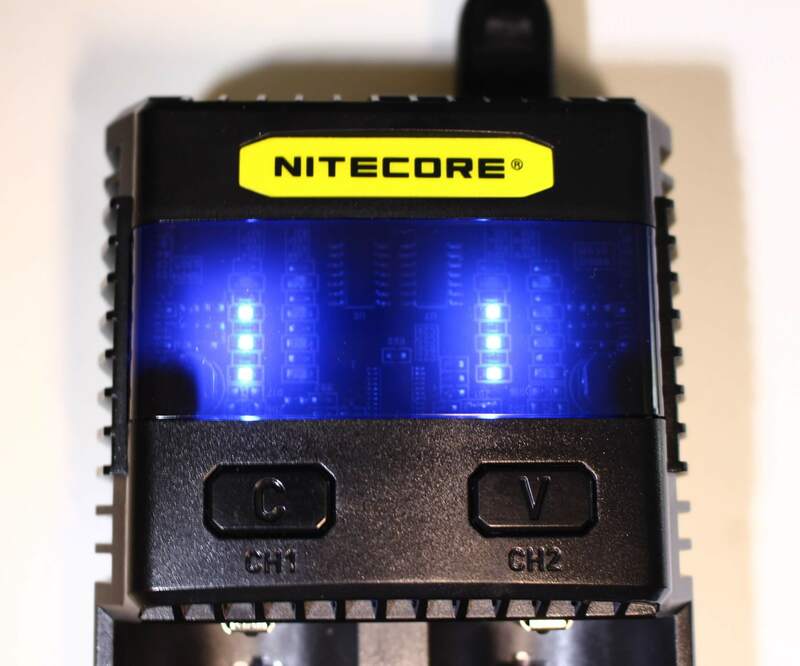 If the battery is an NiMH rechargeable, it’ll select 0.5A for that one as well, and 1.48 for voltage. So when the battery slots are empty, the display shows two rows of “squares” (one row for each slot). 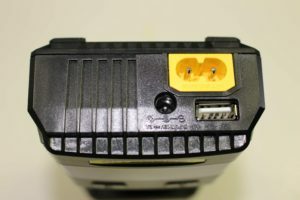 When a battery is placed in the unit, (Slot 1), a second row of squares appears. The blinking square in row 2 is showing you the approximate voltage of the battery (see photo). 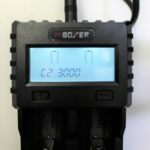 In row 1, the blinking square indicates the current the battery will receive. 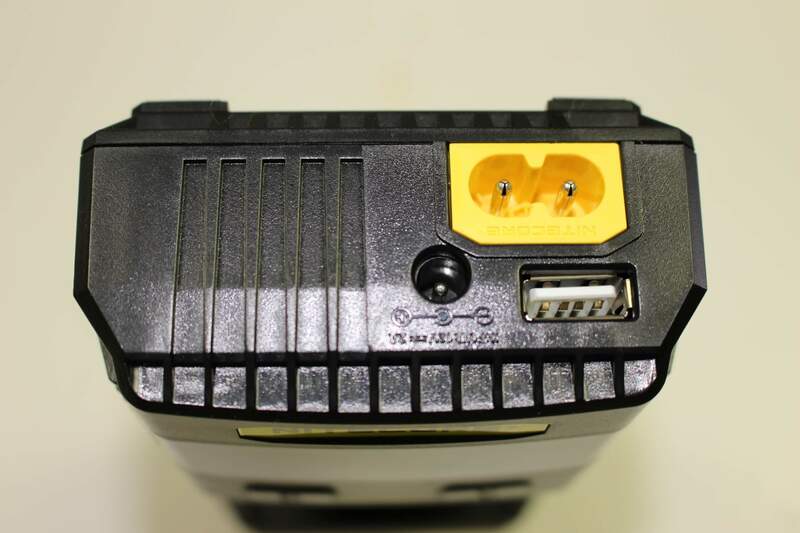 If you place a battery in Slot 2, the same thing will happen again. * Slot 1 only. 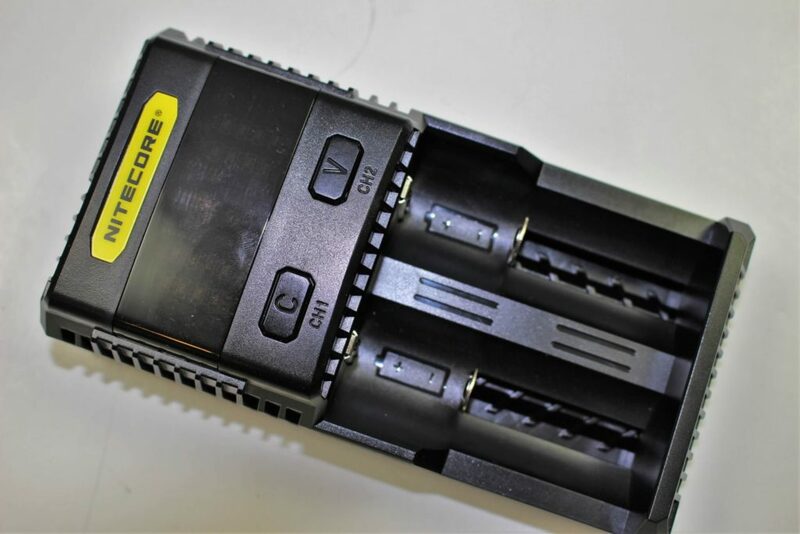 If two batteries are charging together, and slot 1 is at 3A, the maximum allowable current in Slot 2 is 2A. 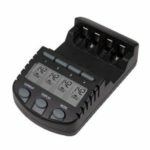 To manually change the values; once a battery is in either slot, wait for it to start blinking, then press the button above the corresponding the slot to enter into manual mode (the display row should disappear). Then VERY quickly, press and hold the “C’ button. This should make each square in the row on the left side, blink separately from bottom to top. 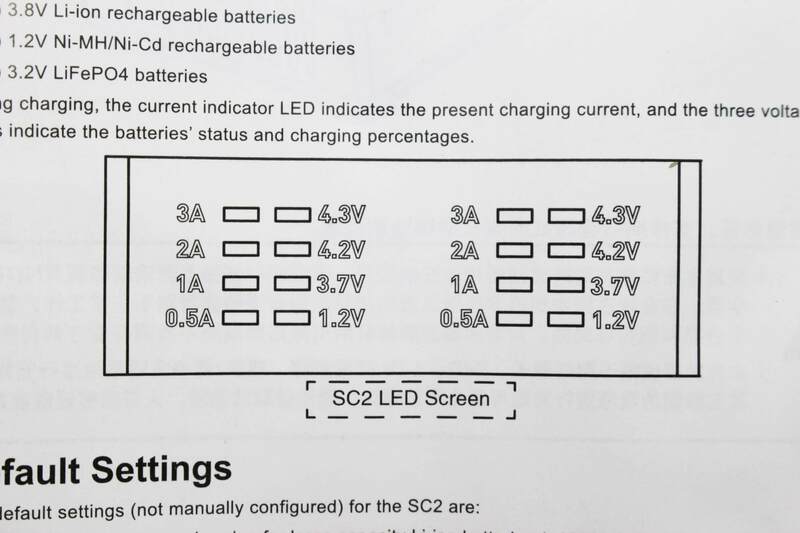 When you see the square lit, that corresponds to the current in the diagram that you want the battery to charge at, take your finger off the button. It will then begin charging at the current you selected. The corresponding squares will blink until charging is complete, at which time all squares will be solid. Note: Manual selection is always available. Even during a charge, you can repeat the procedure and alter the current as you wish. 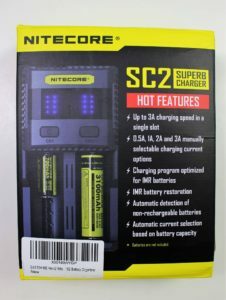 The Nitecore SC2 is a good charger. It depends what YOU want to get out of a charger, as to whether you think it’s a GREAT charger. Personally, I’m used to using an “analyzing” charger. I’m used to having a display show me the precise ending voltage, and not just an approximation. I’m used to seeing the exact voltage when the battery is inserted… not just an approximation. Obviously what the SC2 is built for, is speed! 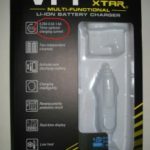 If you’re one of those people who requires that each charge be done as quickly as possible, then the “Superb Charger” might be a wish come true! Currents of 2A & 3A are (so far) unmatched in charging ability. 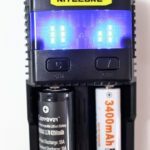 These days, what one company accomplishes, others usually follow, so at some point, charging at 3A might be seen in other brands as well. To date, of all the chargers I’ve used, my Opus BT-C3100 is still my “go to” unit. 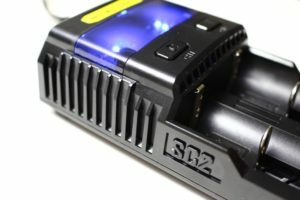 Do I think that even if you already own a good charger, that the SC2 would be a valuable addition? Yes… for two reasons; it’s fast, and it’s very safe! 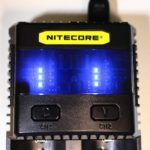 So, if you think the Nitecore SC2 would be welcome in your home, click here to read what others have to say about it, and pick it up for a reasonable price.